This is the right season for mangoes. We prefer to use them as many as possible and cook different varieties with them. They have sour taste. Dal and raw mango, raw mango chutney, raw mango rice, til-raw mango chutney and moong dal-raw mango chutney are some of them. We make pickles with them. It is a kind of festival atmosphere in every household as we pickle them. Peel the skin of raw mango and cut it into small pieces. Heat oil in a wok add mustard seeds, black gram, fenugreek seeds. When black gram turns to light brown color remove from flame and add red chilies and asafoetida. In a blender jar add some portion of mustard seeds, black gram, fenugreek seeds and red chillies. Add salt and make a fine powder of it. Add this powder to the above cut mango pieces. Add the remaining portion of tadka to it. 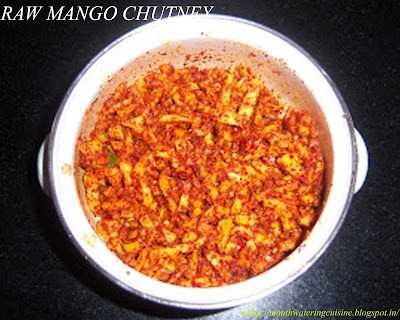 Mix it well so that all spices mix properly well with the mango pieces.